Some mysteries you really don't want to solve. If the thing at the centre of the labyrinth starts hunting you, you'll wish you'd never started searching in the first place. Some truths are buried for a reason. The sound of claws on metal grew louder. Something scraped at the outside of the sealed hatch. 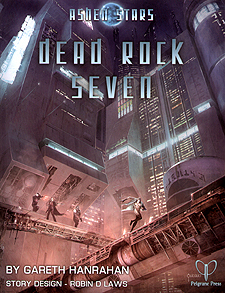 Dead Rock Seven is a collection of four adventures for Ashen Stars from acclaimed writer Gareth Hanrahan (Arkham Detective Tales, Brief Cases, Invasive Procedures). Over the course of these adventures, the lasers are hired to deal with problems as diverse as murders on an old asteroid mine, missing executives on a pleasure planet, and threats to the security of an interstellar cooking contest You can run these adventures as one-shots, as individual episodes in your own series, or in sequence as a self-contained mini-series. The Pleasure Bringers brings the characters to the pleasure world of Andarta, searching for a missing executive who has disappeared into the seedy underworld. In the course of their investigations, the characters discover the bizarre fate of their quarry, and must decide the fate of an entire race. Dead Rock Seven - Something is killing workers in an exhausted mine on asteroid SIS-45546. If the lasers' suspicions are correct, this heralds the return of a deadly foe once thought defeated. Period of Tyranny - A terrorist attack on a passenger liner draws the lasers into the tumultuous politics of the synthculture of Pioneer, where the darkest period of Earth history is repeating itself. The Anaitis Ingredient - The lasers are hired to provide security for a high-profile cooking contest on the Anaitis-17 space station. The station is attacked from within and without by fanatic Restreamers, who intend to trigger a temporal event that will rewrite history.